If you've followed along and enjoyed Parts One, Two and Three...great effort and hang in there, there's just two more to go! I don’t think I’ll be writing much about today. Got up – huge queue for the bathroom – thought we were only supposed to be sharing with 1 other room?! Mark managed a shower but I had to wait to pee until we got to McD’s and the toilets there were so disgusting it very nearly put me off my breakfast! 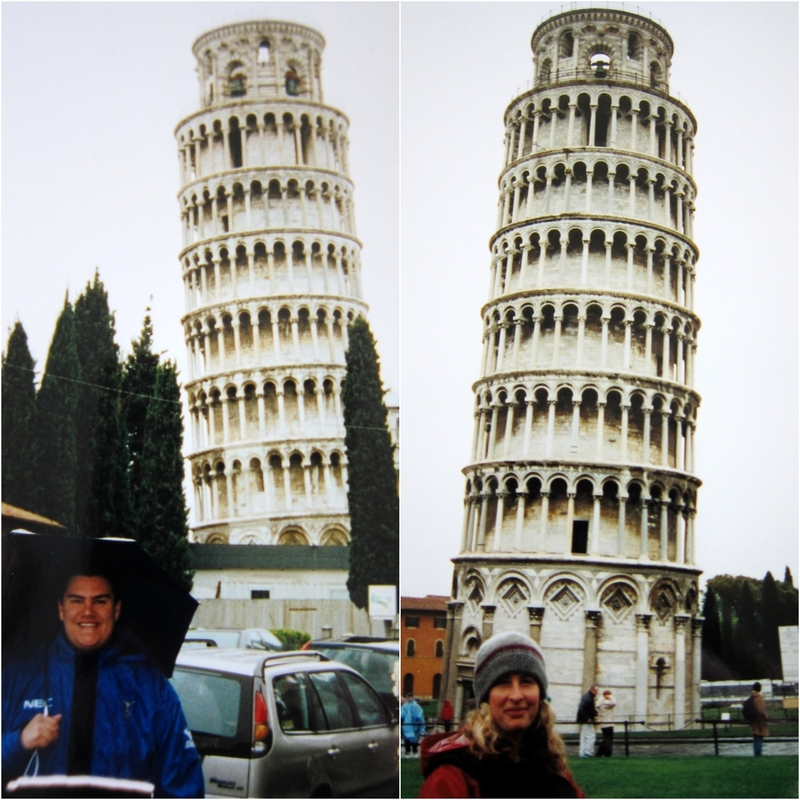 Had a McD’s breakfast meal and then hopped on the train to Pisa – alas it was raining when we got there and didn’t stop the whole time! Still it was very worthwhile seeing the Leaning Tower but that was about all there was to do in the rain. We didn’t fancy going up the Tower as it was 15 euros each (for both of us it would have been ½ our daily budget). The tower is impressive and ridiculous all at the same time – you do almost feel like putting your arms out to hold it up because it does look like its about to go at any moment! Came back on the 15:30 train and surprise surprise it was still raining and my toes were soaking wet and pretty cold from having sat unmoving on the train for an hour so I was very glad to get back to the room to warm them up. I'm also feeling full of cold and pretty bunged up, so I'm not really enjoying being out in the elements this much! It actually made a nice change to stay in and play cards for a while, Trumps, Euchre and Speed – I'm pretty sure I won more than Mark but we won’t remind him of this as he threw a few tantrums at the time! Tonight we went to a meal just round the corner, it was nice but not huge quantities and between us we managed to spill half our wine and stain the tablecloth with various bits of food – doh! Afterwards we went for a long walk round the Duomo, Piazza del Signoria and Ponte Vecchio. Mark bought me some blue sunglasses for 10 euros off some dodgy bloke selling stuff in the street – they are very cool though I can’t say I looked too cool wearing them at night. Both Mark and I have said that we feel ready to go home and I can see that 10 days here might have been almost enough. It is probably not helped by the fact that we got engaged and we can’t wait to see and speak to everyone and it will be well over a week since it happened when we finally can do this. The forecast is for more rain tomorrow which my poor sodden feet could do without, but I'll try not to moan now and just wait and see what the day brings. Oh what a nice sleep in again! We didn’t get up till after 9:30 and it was bucketing down. Willing to do anything to avoid another day of wet feet, I thought I’d try an idea Mark suggested and wear plastic bags over my socks to keep my feet dry inside my not very water tight shoes. Well, it certainly felt a bit weird as my feet kept sliding around but on the whole actually worked a treat! To be honest given the forecast we were very lucky today with the weather as there was only one shower that we got caught in but of course that was after deciding it was safe to take my plastic bags off – typical! 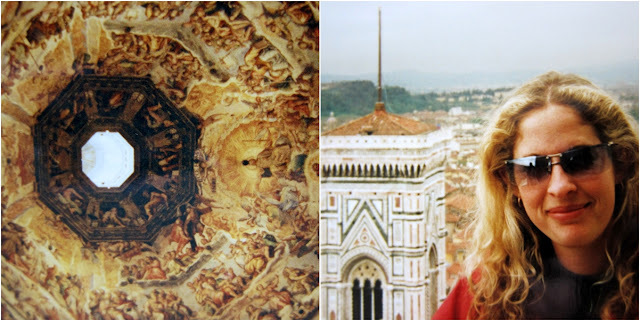 As a good indoors option, we decided to climb the Dome in the Duomo – for 6 euros it wasn't as good as St Peter’s in Rome and poor Markie got a bit claustrophobic – there were some pretty small spaces especially when you had to squeeze past other people. I'm not sure we need to climb any more towers as that’s our 4th tower now – St Peters, Siena, San Gimmy, and here. After the Duomo, we went for a general wander, saw another 2 FREE churches, and ate Mexican taco/fahitas on the run for lunch. We then came back via Ponte Vecchio and the amount of expensive jewellery to dazzle the eyes in that small space is astounding! As both of us were feeling knackered especially my feet from sliding around inside their plastic bags all day, it was back to the room for some r&r, a few card games, and a cheap meal out later. Mark had another dodgy stomach this morning after eating carbonara again last night and is swearing off it for a while. It is weird though because I had the exact same meal and I feel fine. My problem is the world’s tickliest throat and have found myself coughing all day. We got up at 8:30 and checked out, had McD’s for breakfast - yes that was the 3rd day running – I think I’ve had enough now! We were going to take the 10:38 fast train (but it was full), and the next fast train was a whopping 28 euro supplement – um no thanks! Instead we got on a train to Bologne but there were still no seats so had to get off again (having already paid a 6 euro supplement – doh!). In the end we took a slow train to Pistoia. There was meant to be a train leaving 15 minutes after we got there but for some reason not today – so we had to hang around for an hour and a quarter but when the train arrived it was worth the wait as it was a very scenic journey up into the hills much like we remember the Zermatt train trip in Switzerland. Got to Bologne at 14:30 (only 3 hours later than the other train would have got in!) and then on to Venice – the whole journey took 6 hours (instead of 3 on the fast train) and was passed by with music on our walkmans and lots of card games! The hotel was easy enough to find, that is once we exited the right end of the station and is a lovely newly decorated room – OMG we have our OWN BATHROOM too – a big plus! Had a very long, lazy shower – lush! Went to a local, very local restaurant for dinner and ate the biggest pizza/calzones you have ever seen. I had a seafood one (salmon and shrimp) and could only manage 2/3 of it. We wandered around for a bit afterwards – found a pharmacy open (how lucky at 9pm on a Saturday night) and got some cough medicine – I hope it works otherwise it’ll be a long night. We are both pleased we didn’t rush to go in to the centre of Venice, as now we can save that for the next 2 days! It is hard to believe it is already a week since our engagement, boy the time has flown. Another 9am start today, we are being so lazy but we are on holiday after all! Had an OK continental breakfast and went into Venice. Wow, oh gorgeous blue skies how I've missed you, it certainly made for quite the change after all the rain and damp we've experienced these past few days. 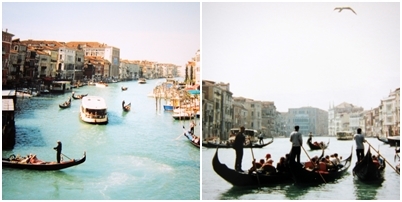 Once in Venice we went for a wander, impressed by lots of small narrow streets, tiny little bridges and canals. We eventually wound our way to the Rialto bridge, it's quite impressive and a bit like Ponte Vecchio in Florence but without all the jewellery shops. Then on to St Mark’s square – St Mark’s church is very impressive from the outside but quite different to St Peters or the Duomo in Florence – much more Russian or Byzantine looking. It is within a lovely square – we were there at high tide and at least ¼ of the square was underwater – sadly for Venice the flooding has gotten far worse in the last 100 years but later in the day it was all above ground again. Found a knock-off Louis Vuitton handbag for Mark's mum, in fact ended up getting 2 Prada ones as well (one for me and one for my lovely sister-in-law). We could have taken the traditional gondola ride but weighed up the cost and instead took a vaporetto (water taxi) ride from one end of the Grand Canal to the other. It was still very scenic and gave you a really good idea of how the canal winds through the whole city. We also went up the tower in St Mark’s square – I know I said no more towers but this one had a lift! Spectacular views but it was a bit chilly and windy up up the top. The clouds were just coming in by the time we left the city at 4:30pm. All in all, we were both so impressed with the city and thought it very magical and romantic, especially in the sunshine. We had dinner again at the local restaurant and got caught in the mother of all thunderstorms on the way there/back – it literally flooded all the sidewalks and we had to walk down the middle of the road. Saw heaps of lightning and it makes us think how extremely lucky we were to get a whole day of sunshine in today. We could go back to Venice tomorrow but feel that we’d quite like to make use of our kilometric train tickets and go to Verona for the day which is supposed to have a few good ancient sites – and like most nights here in Italy contemplating the day ahead, I find myself hoping that the rain has stopped by the morning! Sigh. It's so fun reliving Italy this way! We saw Venice in flood too, which was pretty surreal in an "expected" sort of way. I'm wondering if Mark has an aversion to carbonara now? !